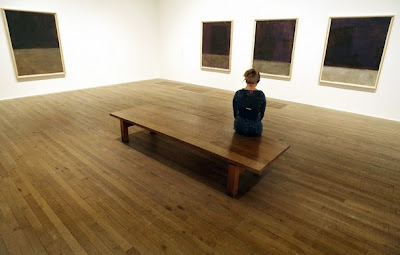 One autumn weekend, Alex and I went to see the Mark Rothko exhibition at the Tate Modern. 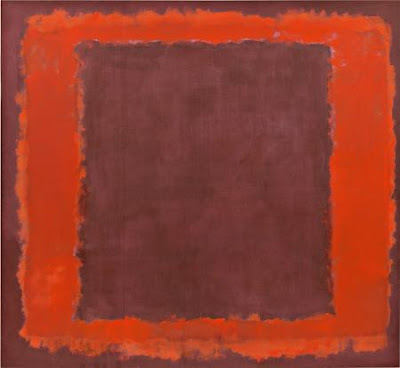 Rothko’s paintings are composed of luminous, soft-edged rectangles saturated with colour, or to put it simply, boxes within boxes inside boxes. 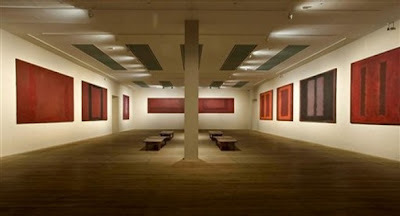 There were many people at the exhibition hall looking at Rothko’s “boxes”, and when I first walked into the room, I couldn’t feel anything. I wondered if I missed something as everyone around me was walking around and gazing deeply from one box to another, seemingly deciphering the secrets residing within the canvases. Feeling frustrated and miserable, I decided to sit down on a bench and relax. After a few minutes I resumed my staring. Now, looking at the boxes seemed like looking out of a window into infinite space. Switching my gaze back to the room, I had the sensation of being in an inverted space. The “outside” that I was previously looking at seemed now to be inverted, enclosed by walls. Everything inside is now outside and everything outside is formed from within. I wondered if I was inside or outside the “box” that was the Main Gallery. Later on I moved from room to room, looking at the themes among the different series. Hung on the wall, the different works were distinguished only by insignificant tonalities among the colors. Limited palette it may be, but each surface was a complex, personalised message. At that point in my life, I was facing quite a bit of stress about looking for a job; the paintings seemed to reach out to calm and soothe my pressures away. The strokes and patterns on the canvases are like the hymms that expresses emotions, and many people compared seeing a Rothko exhibition to being in a cathedral. People often categorize his style as ‘abstract expressionism’, though he always refused to be labelled that way. That statement would have to depend on individual interpretation, like everything else about him – He was very tight-lipped about his inspiration, his ideas, his thoughts, his techniques. Rothko is counted among the most enigmatic and mysterious artist of modern times. He once said: “I am not an abstract painter. I am not interested in the relationship between form and colour. The only thing I care about is the expression of man’s basic emotions: tragedy, ecstasy, destiny.” As a consequence, many people relate his work to darkness, depression and sadness. But – as quoted from an article – in Vogue magazine, only in dark lies true enlightenment, which I thoroughly agree with. And with that sentence I leave you a few links to other articles about him….